Parrot DS1120 review | What Hi-Fi? These intriguing Parrot DS1120 speakers have a mini-jack input for connecting a portable player, but it's the Bluetooth connection that's of most interest to us. 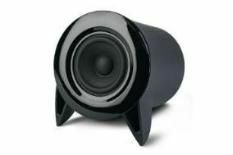 The speakers can receive music wirelessly from a Bluetooth-enabled mobile or PC, or any PC using the supplied dongle. It all works seamlessly – which makes the lacklustre audio all the more galling. Metallica's Until It Sleeps lacks weight and there's an uncomfortable edge to the midrange and treble along with an overall lack of finesse. A fine idea – if only it sounded a little better.